Fact a) has been declined by numerous members of the crew. In fact, it was stated that all the lines Orson Welles improvised for The Third Man where him whining about his diet issues and of course, the renowned cuckoo-clock speech. Fact b) was never even taken seriously. In order to understand Orson Welles' backstage rationals it's important to understand his self-opinions. Now, as I was saying Orson Welles was infuriated by the lack of attention for his recent play Chimes At Midnight. 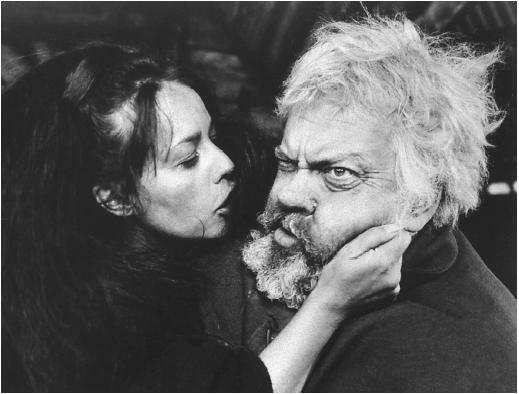 The main character of Chimes At Midnight, Falstaff, was Orson Welles' ambition in life. So, Orson Welles decided the only option was to make Chimes at Midnight into a movie. 1965. Chimes At Midnight is at its Cannes Films Festival. Chimes At Midnight won 20th Century Anniversary Prize and Technical Grand Prize, two awards at Cannes. However, who wanted to watch an old fat man run around reciting Shakespeare? No one. Even a large portion of Orson Welles' dedicated fans skipped out on this one. Orson Welles did not give any interest in what audiences and critics thought of his work and therefor he dubbed this film his greatest work. In Henry IV, there was a character named Falstaff. Orson Welles took this character and made Chimes of Midnight. Falstaff is a fun loving man. He adores to express his comical views on existence. As well, Falstaff lives for getting drunk. He was loved by all and undeniably a very social man. However, as Falstaff has become old and fat he no longer is at his time of power. His son, Henry V is given his chance for power. Falstaff is repelled by his son's immature abuse of power. This begins a war between Falstaff and his followers and the young immature followers of Henry V. As this continues, Falstaff begins to learn that his son is stronger than him and even though his son is wrong, there is little Falstaff can do. The Good: It's obvious, when you give the right person a chance to act in or direct Shakespeare play - you are giving them a chance of a lifetime. Orson Welles had this opportunity multitudes of times. Now, I have had the pleasure (and some times the disappointment) of seeing several adaptations of William Shakespeare in both films and plays. However, there is no doubt that I have ever seen Shakespeare preformed more excellently than in this very film. When you adapt Shakespeare you say the lines that are in his script... but why? Why can't it be done another way? Why can't you change every line Shakespeare every wrote... and make it better? Why can't you? Well, possibly because it's one of the hardest things a person could imagine doing. If you've had the honour of analyzing Shakespeare you'll find that there is rhythm and pattern in each line he has written. When Orson Welles wrote his play in the style of Shakespeare, he followed these rules Shakespeare wrote by with the most accurate precision imaginable. Now, a vital factor to remember is that Chimes At Midnight's budget was practically non-existent. Chimes At Midnight proves how much can be done with a budget that is slimmer than Jane Wyman's legs. Falstaff: My King! My Jove! I speak to thee my heart! The Bad: I once planned to start a blog called 'Should I Bring A Pillow', a site dedicated to reviling the truth of whether a movie that is highly acclaimed is indeed boring. It's needless to say Chimes At Midnight has you constantly glancing at your watch. It's clear that Orson Welles felt Shakespeare was only watched because he thought it was classic ("Now we sit through Shakespeare in order to recognize the quotations" - Orson Welles on Shakespeare), he had read every play written by Shakespeare and was so possessed that he was incapable of thinking up his own ideas. It's sad that Orson Welles felt the only way he could create another masterpiece would be by ripping off the writing of one of the world's greatest writers. The Ugly: Never in the history of cinema has a man gone from being considered one of the most attractive filmmakers to utterly repulsive. From some of the images above you can tell what Orson Welles did to himself to help suit the character of Falstaff. He is heavily bearded, at the bottom of his beard it curls. His mustache looks as though it is a separate part from it's beard, in fact it looks glued on. He is the size of an elephant who just ate one-hundred too many peanuts. However, Falstaff is a beloved character nonetheless. Before I display the rating below, I am going to have to explain that although Chimes At Midnight is one of the best films of the 1960s it's brilliance did not effect me as much as it had the potential to. Therefor, when I rate Chimes At Midnight below you should understand the rating is based on how much I personally enjoyed the movie. Without a doubt, if I were to judge Chimes At Midnight based on it's quality, it would receive a 10/10.